I predicted that since I had planned a morning of fun, it would end terribly, in disaster. I never could have guessed how ridiculously disastrous it would be. Sometimes I look at my life and just laugh, because seriously, you can't write this stuff! So we started the day lazy because they wanted to watch the Halloween episodes of PBS shows. So we didn't start baking into almost 10. However I was prepared and had all the ingredients out and ready to go. Monkey was going to measure and Peanut was going to pour it was going to go so smoothly, all we had to do was get dressed. Then it struck, tears, crying, wailing, yep Monkey was constipated again (seriously there is nothing worse than toddler constipation we have been dealing with it for 2.5 years and every time we get it under control...this happens). So after tears (him) and yelling (me) we decide he will not help and he will sit in the bathroom or he will not be able to go to school and the party. So Peanut (who remember is 2.5) follows me into the kitchen and yells, Help! Help! ME Help! Over and over again while I try to quickly measure things out for for so she can dump them in. Keep in mind all the while my son is in the bathroom alternating between sobs and wails (I know I shouldn't skipped baking but the ingredients were out and melting). So we get to the cinnamon and Peanut wanted to smell it. It's something hubby started with them to get them into cooking, smelling flavorful things. Only instead of inhaling, she exhaled, forcefully, into the finely powdered cinnamon. Which blew up like an a-bomb in her face, getting in her eyes and nose. What happens when a dramatic 2.5 year old gets cinnamon in her eyes and nose? She starts screaming, I mean SCREAMING. So I grab her and run to the bathroom where my other child is crying (and it s not a very big bathroom) and I try to get her head under the water to rinse her eyes. But she is freaky strong (her gymnastic coaches agree) and it's like wrestling a super midget. At this point in small echoing space with two screaming crying children I just start laughing, hysterically laughing. What else could I do? This could only happen to me. All because I wanted to have a fun morning! She was "singing" to the song and dancing (headbanging and bouncing around) and again I was laughing, because she looked and sounded just like animal. Yes, apparently I am raising animals. 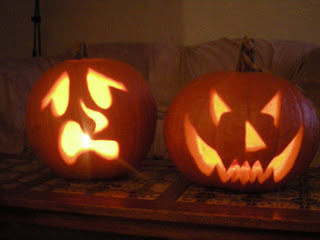 But they had fun none the less and the pumpkins were carved with no incident....they are always angels for daddy! So Halloween should go just smoothly since Daddy will be home! The cinnamon in the eyes, YOWZERS!! !